UPDATE 1600 GMT: United Nations envoy Lakhdar Brahimi says the Assad and opposition delegations have finally agreed to sit in the same room on Saturday. There is no indication, however, that they will speak to each other, only to the envoy. President Assad’s delegation at the Geneva II conference has refused to enter direct talks with the opposition Syrian National Coalition. 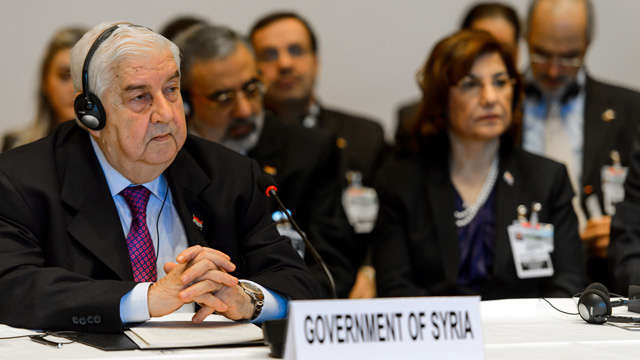 United Nations envoy Lakhdar Brahimi had hoped the discussions could begin on Friday afternoon, but both Foreign Minister Walid al-Moallem and senior Assad advisor Bouthaina Shaaban made clear on Thursday that there could be no exchange unless the opposition renounced “terrorism”. Shaaban went farther and said the Coalition, led by Ahmed Jarba, only represented a small number of the Syrian people. The Coalition also refused direct discussions unless the regime delegation accepted a June 2012 clause for a transitional governing authority, one which the opposition insists will not include President Assad. “We have explicitly demanded a written commitment from the regime delegation to accept Geneva 1. Otherwise there will be no direct negotiations,” opposition delegate Haitham al-Maleh said. Brahimi will meet the two sides in the same room on Friday and explain how he plans to proceed; however, while al-Moallem and Jarba will address the UN envoy, they will not speak to each other. We have started to look into the future without [the President. Assad and all of his regime is in the past now. Nobody should have any doubt that the head of the regime is finished. This regime is dead. Amid the “peace” conference in Geneva, the Assad regime stepped up bombing on Friday, hitting insurgent-held areas in Damascus, Aleppo, and other locations. The Lebanese branch of the Islamist faction Jabhat al-Nusra has warned civilians to stay away from all Hezbollah facilities and gatherings. Jabhat al-Nusra has carried out two bombings in the last eight days, including Tuesday’s blast in south Beirut, that killed nine people. The group, a leading faction in the fight against the Assad regime, said it will continue the attacks unless Iran and Hezbollah withdraw their fighters from Syria. Michel Kilo, a member of the Syrian National Coalition’s delegation in Geneva, has said the opposition will produce proof of the Assad regime’s links with the Islamic State of Iraq and as-Sham. The pictures were taken before they became emirs in ISIS, when they were all officers in the Syrian special service. There are documents sent by the special service to ISIS telling them to capture or kidnap people in Raqqa and Jarabalus, and these documents will be published. And you will see how the regime fabricated these extremist groups that did not exist in our country at the beginning of the revolution. Insurgent factions are fighting ISIS — which has been accused of kidnappings, torture, and killings of both civilians and factions — across northern and eastern Syria. BREAKING: Foreign minister says delegation will leave Saturday if "serious" talks don't start, according to Syrian TV. Syrian President Bashar Assad intends to remain in power until “democratic elections” are held, Syria’s Information Minister, Omran al-Zoubi said Friday. “The Syrian President will stay in power until elections are held, which must be democratic and in which everyone can participate, but before they are organized terrorism needs to be overcome, and there must be an end to the killing of civilians,” Zoubi told reporters at the Geneva II conference. Footage from Thursday shows a young girl being dug out alive from underneath rubble in al-Ma’asaraniyeh, Aleppo (click here for a map). Deputy Prime Minister, Foreign and Expatriates Minister, Head of the Syrian official delegation to Geneva 2 conference met on Thursday the UN envoy to Syria Lakhdar Brahimi. Talks during the meeting, which was held at al-Moallem’s residence in Geneva, dealt with the procedural arrangements to launch dialogue with the coalition delegation called “opposition “at the UN headquarters in Geneva at 11 a.m on Friday. Those who call themselves “opposition” have no real presence or representation on the ground and they are talking with the tongue of the US and the Gulf states to serve their interests.